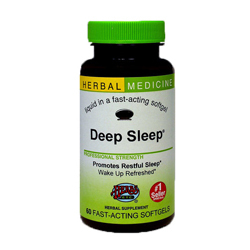 Deep Sleep® by Herbs Etc., is specific for inability to fall asleep, waking up frequently during the night with difficulty returning to sleep, waking up too early in the morning or experiencing unrefreshing sleep. Reduces sleep latency (amount of time required to fall asleep) and stops excessive mind chatter. Also for inability to fall asleep from tiredness, waking up groggy or tired, as well as for fitful and/or agitated sleep. Re-educates the brain sleep center and creates positive sleep patterns. It is not habit forming, has no side effects and does not interfere with REM (rapid eye movement) sleep. Fresh California poppy allows you to fall back to sleep if you awaken during the night or too early in the morning. It gently and gradually normalizes your sleep patterns. Fresh Valerian helps you fall asleep more quickly. It eases you to sleep when mild pain, intestinal tension, or menstrual cramps keep you wide awake. This herb has been used for centuries to calm emotional stress or an overactive mind. Fresh Passionflower quiets a chattering mind. This herb is also suggested for the uneasy sleep that often occurs during menopause. Fresh Chamomile, though gentle enough for fretful babies, is surprisingly effective for adults. It calms restlessness and takes the edge off of mild aches and pains that interfere with peaceful sleep. 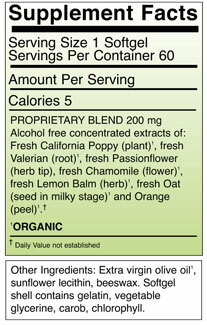 Fresh Lemon balm, when combined with California poppy, re-establishes a healthy sleep pattern. Its fragrant volatile oils gently relax your nervous system and settle upset emotions. Your breathing and heartbeat become steady. Fresh Oat seed is a nourishing nervous-system tonic. It soothes frayed nerves and is perfect when you're "tired and wired." If sleep is fitful because of a long-term ehalth challenge, Oat seed helps you get the restorative sleep you need so you can recover. Orange peel rounds out the Deep Sleep® formula. It helps all the herbs to be absorbed so they can deliver their beneficial effects throughout your body.